Where has the time gone? In many ways it seems like yesterday that I was a young whipper-snapper beginning my career at Boeing (St. Louis, MO 1985). In the blink of an eye, here I am writing this newsletter about celebrating my 30th year in Leadership Development/Organization Development. I humbly share my top 10 lessons learned about my favorite topics. not fit all. Leaders constantly evolve. Being authentic helps leaders develop their own styles. They nurture their people, they look for opportunities to serve and always keep their eye on the vision and strategy of the organization. Coaching is not a last-ditch effort to save failing leaders. It truly is a “gift” for further enhancing the strengths of successful professionals and leaders. The confidential aspect of coaching allows both the leader and coach to dig in and explore new approaches to issues, problems and opportunities. Coaching is built on asking great questions–not telling or prescribing the “right answer”. 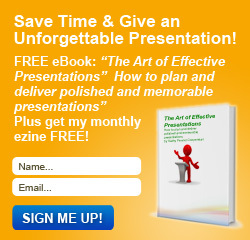 EVERYONE can be a better presenter! I’m 100% convinced of this. Having worked with thousands of individuals and groups on communication and presentation skills, I see fear and apprehension turn into achievement and satisfaction. This comes from increasing awareness–seeing ourselves as others see us (video-recording) and then focusing on only a couple of areas at a time. With planning and practice, success is within reach. Every time! I promise! There are some basic but critical parts to our communication–speaking is a small part of the overall communication package. Communication is only successful when both parties leave the conversation with the same meaning–sounds easy . . . but it’s hard work! Conflict is good. Conflict is bad. It is both. Great leaders know the difference and can sense when differences of opinion are about to cross the line into destructive conflict. Every conflict should not be handled the same way. 2015 has brought significant changes to my life. Some have seriously rocked my world. It’s made me experience the concept of “change” in a whole new light. For years, I’ve consulted to organizations, helping leaders learn how to lead change. I’ve led scores of workshops to help individuals “navigate change”. Most experts agree that change is like a two-edged sword. It can feel like a time of danger but also can be a time of opportunity. Over my 30 years in Leadership Development, I have frequently facilitated executive leadership programs. “Change” inevitably comes up as a dreaded topic during discussion groups. In the past, I’ve been quick to jump in and encourage people to view change as inevitable and as an opportunity. I now have a different point of view. Change often feels like and is loss. I now understand that much more clearly. Leaders leading change efforts will be more successful once they understand the impact of changes on others (real or perceived)–both positive and the real negative consequences. We are too quick to stop listening and begin formulating our response that we miss much of what a speaker is saying. Like most interpersonal skills, listening effectiveness can be improved with self-awareness, understanding how to listen better and lots of practice. A very popular topic over the past several years is “Influencing without Authority”. Many people are in the business of selling ideas, concepts or services/products. What’s the most important thing to remember about influencing? We all have various sources of power to draw from. These sources of power can be tapped into in various situations and with various individuals to achieve a particular outcome. What are these sources of power? What is the most effective source of power? The top two are referent power and expert power–both within your control! I’ve saved the best for last. Of all the studies I’ve reviewed, all the workshops I’ve conducted, all the leaders I’ve coached, I have learned that nothing makes up for a lack of kindness. For 30 years I’ve asked workshop participants to describe the “best leader” they’ve ever worked for. Kindness is always at the top of the list–a leader who genuinely cares about his/her people. Can this be taught? Yes! I believe the greatest insight comes from the feedback in a 360 process. Being self-aware and living the “golden rule” makes a moderately successful leader a truly memorable one. Having worked with Kathy for going on 4 years, I enthusiastically recommend her as a kind, capable, and professional coach and consultant. In addition to her requisite expertise in the areas of leadership and organizational development, Kathy has a simply unrivaled sense of kindness in the way she approaches her work. She has the ability to be both observant and highly empathetic at the same time; in other words, Kathy can see “the truth” in people, but also talk with them in a way that they are able to hear and accept it. I have seen Kathy utilize these strengths often and with great success for leaders and organizations. For any leader in need of a compassionate truth teller, there are few people I would recommend more enthusiastically than Kathy.